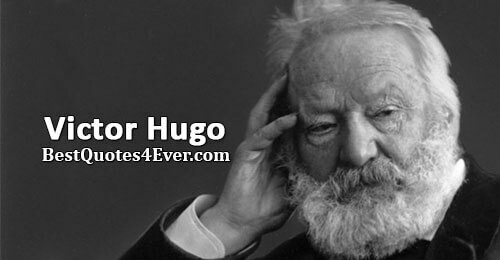 Victor Hugo was a French poet, novelist and playwright and a leading supporter of the Romantic Movement in France. He was also a visual artist, statesman and human rights activist, though his fame primarily lies in his poems and dramas. Should we continue to look upwards? Is the light we can see in the sky one of those which will presently be extinguished? The ideal is terrifying to behold... brilliant but threatened on all sides by the dark forces that surround it: nevertheless, no more in danger than a star in the jaws of the clouds. In every French village there is now a lighted torch, the schoolmaster; and a mouth trying to blow it out, the priest. Le coupable n'est pas celui qui y fait le péché, mais celui qui y a fait l'ombre. The wise man does not grow old, but ripes. What is admirable in the clash of young minds is that no one can foresee the spark that sets off an explosion or predict what kind of explosion it will be. Un sceptique qui adhère à un croyant cela est simple comme la loi des couleurs complémentaires.Ce qui nous manque nous attire.